NumaList Plus provides DICOM Modality Worklist functionality and security for ADAC/Philips CardioMD®, Siemens e.soft® A/P and ADAC/ Philips cameras with the Pegasys® workstation. . Integrating Windows® XP , 2000 and legacy systems running unsupported operating systems has never been easier. NumaList Plus provides the HIS/RIS information that PACS requires and the security that modern hospitals demand. Since the announcement that Windows XP systems will no longer be supplied with security updates, IT professionals have been scrambling to protect these vital and valuable imaging systems without blowing the capital equipment budget. 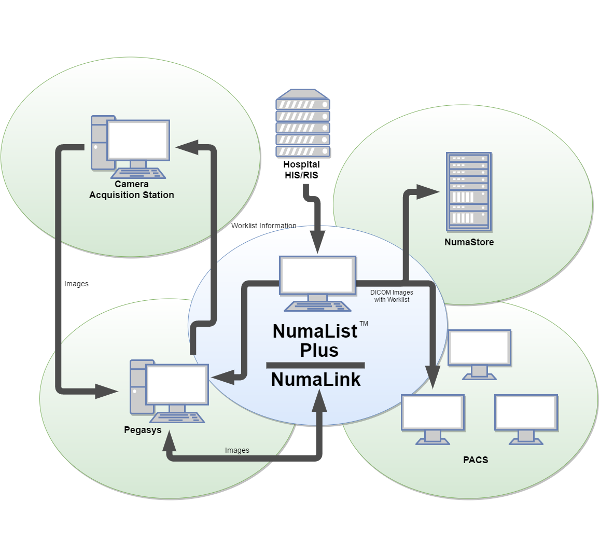 Using two network interface cards, NumaList Plus offers security by separating the unsupported systems on their own isolated network, yet provides a DICOM bridge to the HIS/RIS, PACS and other workstations on the hospital network. IT professionals can confidently roll out OS and anti-virus updates to the NumaList Plus Windows 7 or 10 host OS without interfering with the operation of NumaList Plus or the legacy imaging systems. Provides full DICOM Modality Worklist functionality for Philips CardioMD®, Siemens e.soft® A/P and ADAC/ Philips Pegasys® systems. Isolates acquisition stations and workstations running Windows XP and other legacy operating systems from the hospital network. Supports Windows 7/10 updates, anti-virus updates and other security measures mandated by IT professionals. Reduces typing errors and increases efficiency by automatically adding DICOM Worklist information, patient demographics and accession # to the patient image files required by PACS and EMR integration without user manual entry. OS updates and anti-virus applications do not interfere with the operation of NumaList Plus. Process studies from a legacy camera or workstation on another vendor’s modern workstation or PACS.